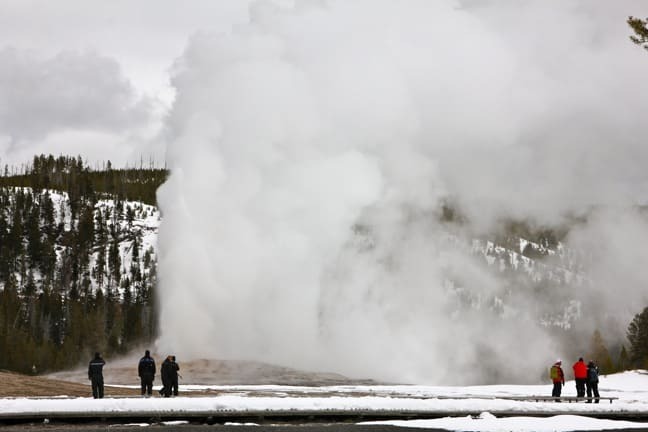 Our fourth day in Yellowstone National Park on Off The Beaten Path’s Winter Wonders Tour got off to a bang (OK, more like a whoosh) as we hiked through the Upper Geyser Basin, home to the largest concentration of geysers on the planet. 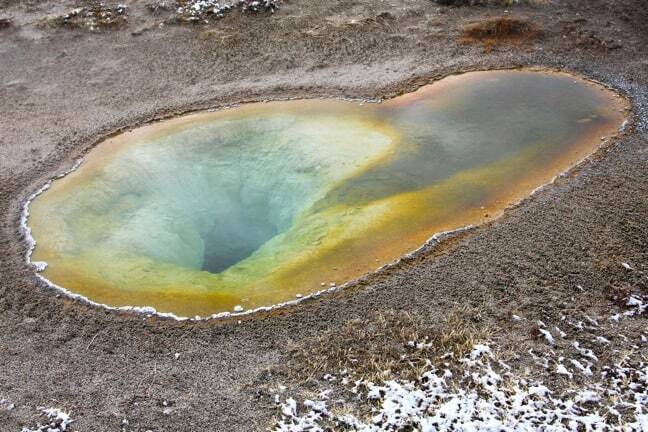 There were geysers erupting, mud pots bubbling and hot springs boiling everywhere we turned. Unfortunately, I can’t show you most of them, because I made the most dunderheaded move of all time and deleted more than half of the photos I took that morning. D’oh! 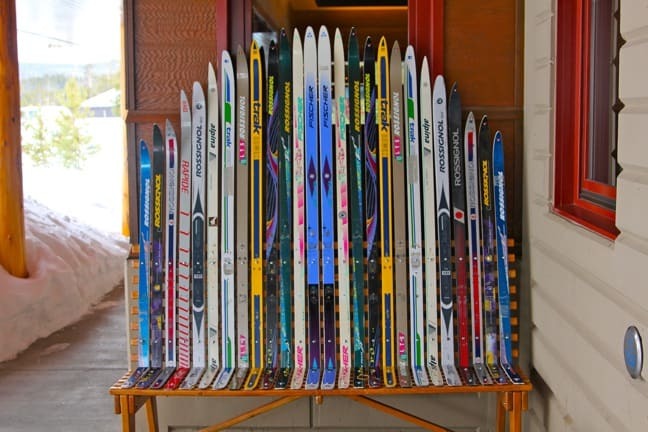 But hey, doesn’t this bench made out of colorful skis look cheery? Fortunately, not all the day’s best shots were lost. In fact, this photo represents the closest we got to a bison in Yellowstone– he was perhaps 25 yards from the path– and I was ecstatic over finally getting the close-up portraits I’d been hankering for. I lost the ones right before this, in which he was using his massive head and horns to push aside the snow in search of the tasty grasses that lie beneath. But if I ran National Geographic, I’d put this pic on the cover! Speaking of Nat Geo, guess who we ran into on our morning hike? (And I mean that quite literally, as the boardwalks are very narrow and they had a TON of gear.) This film crew was there shooting a nature documentary on Yellowstone, and we were amused to learn that the man in the background was a park ranger who was essentially there to babysit the cameramen and make sure they did not deviate from the path in search of a better shot. I got a visceral thrill knowing that I was taking photos of the same bison they were shooting! One of the more interesting geothermal features we saw along the way was the multi-hued Belgian Pool, a hot spring with a temperature of around 180 °F. Originally called Oyster Spring due to its shape, it was renamed after a visitor from Belgium fell into the spring in 1929, with fatal results. This morning marked the first of our trip in which the sun flirted with emerging full-force, and this photo captured the first moment when the sky broke and flooded the Upper Geyser Basin with light. 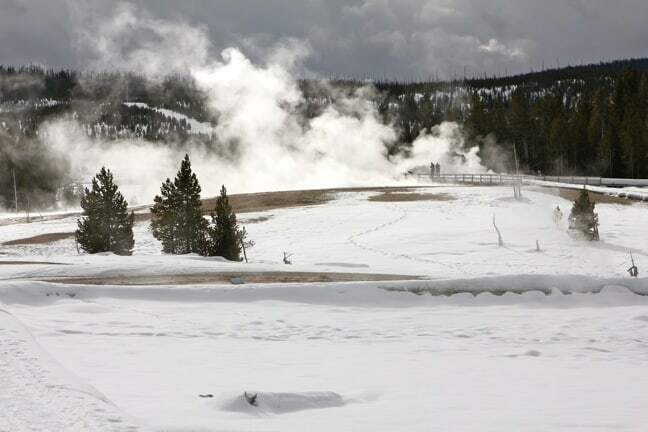 I love the way the light catches the smoke from the geyser in the distance, and also the myriad animal tracks in the snow, which were a mixture of bison and coyote. With the sun popping out in brief bursts, the Upper Geyser Basin was finally revealed in its full glory. 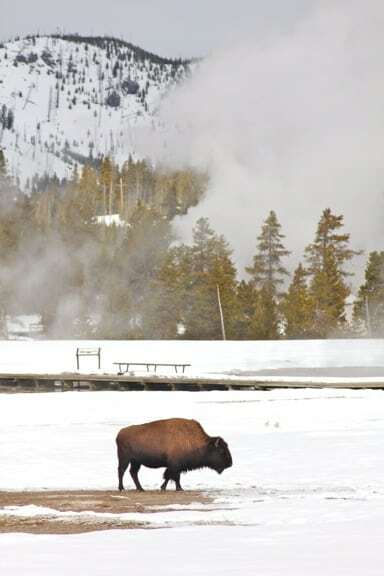 A bison herd roamed the lower plain, seemingly oblivious to the fact that they were surrounded by erupting geysers, steaming fumaroles and spring so hot, they could wind up as bison stew on the lodge’s menu with one misstep. But with the snow, the steam and the evergreen-capped mountains all around, it made for a picturesque morning hike. You’ll simply have to believe me when I tell you that I had tons of great shots like this one before I accidentally deleted them, including an amazing one with Anemone Geyser erupting in the foreground and Old Faithful erupting in the background. But I was happy that I didn’t lose this one of Castle Geyser erupting, as I loved the way the pool, the steaming fumarole and the geyser’s spray were backlit by the ominous clouds. 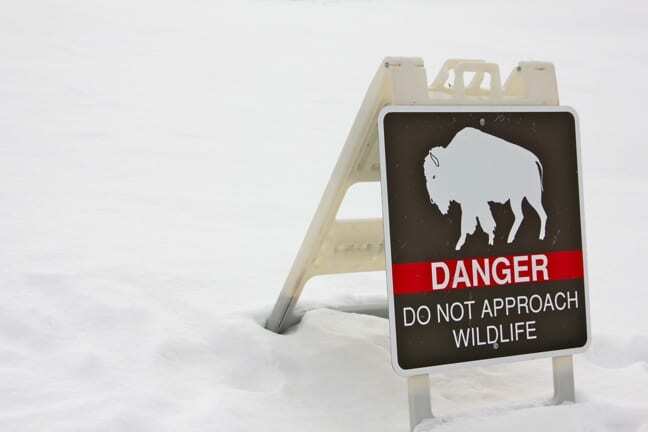 As I’ve said in another post, we were surprised to realize that bison are responsible for more human deaths in Yellowstone National Park than all other animals put together, so we took this sign seriously. Other tourists clearly did not, and I shook my head in disbelief as one man edged closer and closer to a massive male bison as his worried wife tried to take his photo. 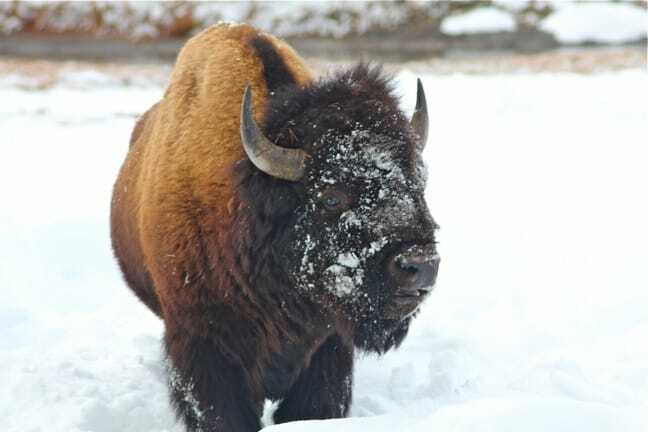 They may look like big ol’ teddy bears, but bison are ornery and can run shockingly fast. 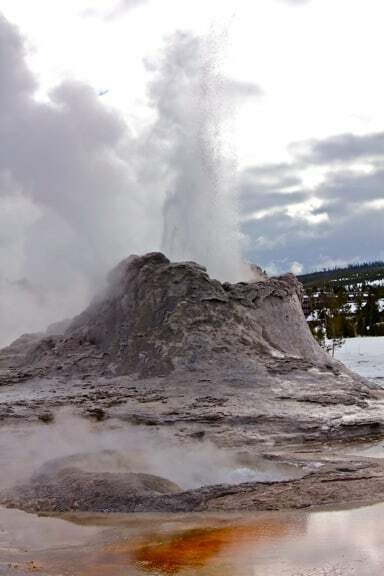 Though my best photos of Old Faithful have gone the way of the dodo, our extended morning hike allowed us to witness Yellowstone’s most punctual geyser (which erupts every 90 minutes or so) doing its thing twice. From this angle, we got a great perspective on its impressive height (an average of 145 feet), as it spews 3,700 to 8,400 US gallons of boiling water for anywhere from 1.5 to 5 minutes. 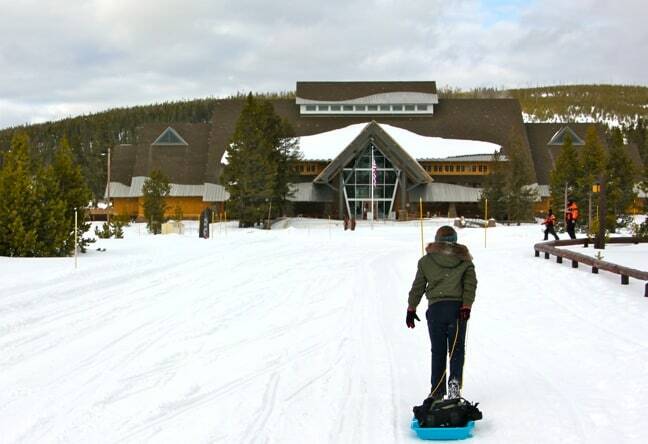 All week my daughter had been dying to go sledding in Yellowstone, and finally at the Old Faithful Snow Lodge she got her chance. After lunch and a brief rest, we loaded up a plastic sled and headed back behind the Old Faithful Inn, where we’d been told we’d find a perfect little hill. Along the way, we say a gorgeous coyote walking alongside the building pictured here, but unfortunately he was too far away to get a good shot. Regardless, Alex had a blast sledding down the Inn’s driveway, and we’ll have some hilarious video coming soon. 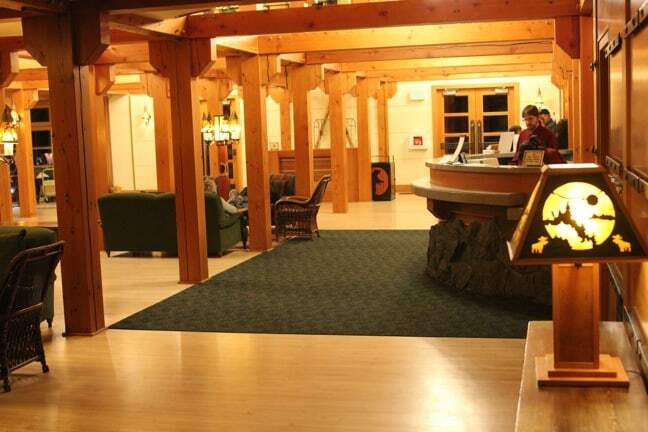 We’re not normally big on photographing hotels, but the Old Faithful Snow Lodge was really a beautiful place unlike any place we’d ever stayed. 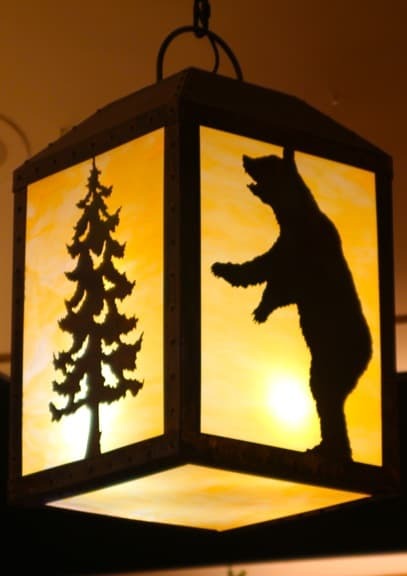 Though it was opened in 1999, the lodge looked and felt new, with gorgeous wooden beams everywhere you looked and rustic decorative accents that reminded me of Georgia’s Appalachian mountain culture.